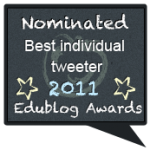 Nominated for Best Individual Tweeter 2011. Thank you! 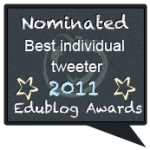 The 2010 Edublog Awards – Voting open NOW! 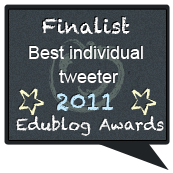 I’m surprised and flattered to see myself nominated for the ‘Best Individual Tweeter‘ in the 2010 Edublog Awards! 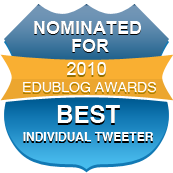 I have to thank all the great educators in my PLN for their valuable tweets. Frankly, I’m more of a ‘RT’ tweeter. 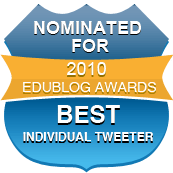 Hence without my PLN my Twitter account will not have much relevance.